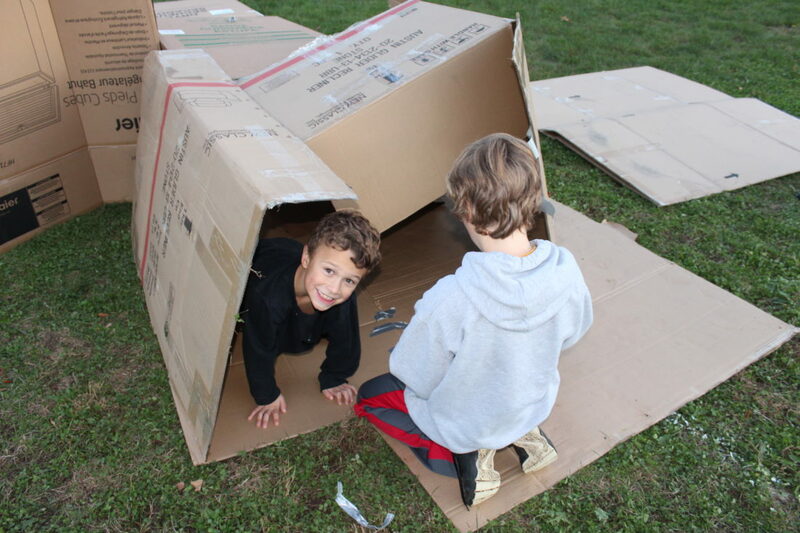 CARA MORNINGSTAR/Sun-Gazette Cooper Mackey, 6, and his brother Jackson Mackey, 10, work on getting their cardboard box camp for the evening set up during the Box City event for Family Promise of Lycoming County and American Rescue Workers at Lycoming College campus on Friday. Participants slept in cardboard boxes overnight in order to promote awareness for homelessness. 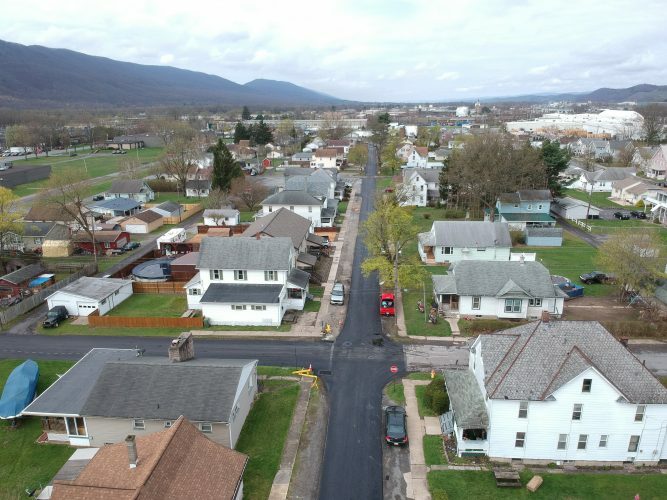 In an effort to bring awareness to homelessness, American Rescue Workers and Family Promise of Lycoming County joined forces in hosting the Box City event for the first time together at Lycoming College campus on Friday. cardboard structures to let them camp out for the evening in the elements. The event went from 6 p.m. Friday evening until 6 a.m. Saturday morning. “Everyone grabs a box, and there’s a whole lot of duct tape … City Alliance Church created hand warming packs to encourage people for what they’re doing tonight for awareness,” Magargle said. A few people talked about homelessness, there was some music entertainment and food for participants. There were even some burn barrels set up on the field. Those who were sleeping outside were also encouraged to get sponsors to help provide a little extra to raise money for those who actually suffer from homelessness in the area. “At 10 p.m., we turn off the lights, and everyone experiences what it’s like to be out in the elements in a box,” Magargle said. She said the event was about who Family Promise is as a company as well as the people they serve. Valerie Fessler, community engagement and development officer for the American Rescue Workers, said that the event itself was about bringing awareness to the community. Fessler said that sometimes homelessness can be overlooked because those who suffer from it are not always visible to anyone else. “This is a real need, and it’s sort of a hidden problem that people don’t necessarily see. It’s a real problem in our community,” she said. Katie Mackey, of the city, came out to participate with her sons, Jackson Mackey, 10, and Cooper Mackey, 6. “I have volunteered for Family Promise in the past and have seen how the organization assists families in our community, so I wanted to share our support through raising money for a great cause,” she said. She said helping her local community was important to her and her family. Cooper said he was looking forward to the event because it seemed like fun. Brianna Laslette and Bethany Young, both Lycoming College freshman, said they came out because they wanted to promote awareness in the community. Young said that people don’t believe that it’s an actual problem. Laslette said it’s important to know how fortunate people are who are not homeless. “No one realizes how lucky you are, and I feel like having something like this helps you understand it,” she said. Visit www.arwwilliamsport.org or www.familypromiselycoming.org for more details about helping people in the community.